The Tipp TATLER is a free magazine with full colour throughout, promoting all types of business and services through advertising and supporting articles. 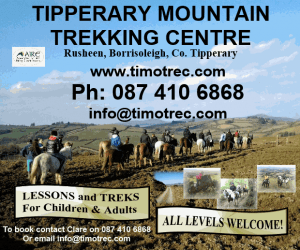 It is widely distributed throughout North Tipperary and surrounding areas. Are you getting Results from your advertising? With distribution from Thurles to Nenagh and Roscrea to Tipperary Town and Cashel, plus the smaller towns and villages around these towns, your message gets out to a wider population. Your advertisement is created with your customer in mind. What are their needs? What will make them choose you over your competitors? Using proven copy-writing techniques involving headlines, graphics, colour, logos and body copy your advertisement will be visually attractive, attention grabbing and where possible placed alongside editorial related to your business. As a magazine with many informative articles, humour, competitions etc. the Tipp TATLER remains around the house/office/waiting room for longer periods and is referred back to more often and read by many people. This ensures your advertising works harder for you. As a free publication it is read by everyone in an area regardless of how long they have lived there. Newcomers to a town don’t have the same loyalty to the regional press as longer inhabitants. That makes it a perfect vehicle to get your message across to anyone recently moved into an area. 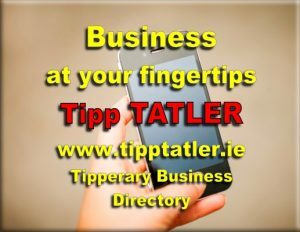 All our advertisers receive a FREE listing on our Tipperary Business Directory giving you even greater exposure over time at no extra cost. Having your business details in print makes it easier for your potential customers to find out what you do and how to contact you. Regular exposure to your potential customers places your business at the top of the list when the consumer is ready to make a purchase. You can also email info@tipptatler.ie.